I picked up DWM 424 last summer partly because of its look back at The War Machines, the story that saw the debuts of Polly and Ben Jackson (but more on them later). And it is a great cover photo. Series 6 will start in one week! For the first time in the Doctor Who revival, a new series will start with the same Doctor and companion(s) that ended the previous series. What you may also not know is that Amy and Rory are the first companions of the Doctor to be wedded while still companions. I am not counting Donna’s wedding at the end of End of Time, because she was no longer the Doctor’s companion; moreover, he still could not contact her, lest her mind implode (again). But it wasn’t always this way. There’s a significant strand in the analysis of this 2nd Doctor serial about the internal politics involved in the writing out of companions Polly and Ben, and their possible replacement. In The Faceless Ones, that was Samantha, played by Pauline Collins (who would later portray Queen Victoria in “Tooth and Claw”). What’s notable is that Samantha didn’t become a companion, and at the end of Faceless Ones, she kisses Jamie goodbye. The analysis makes note of that and attributes previous companions’ departures (notably Susan and Vicki) to the fact that falling in love hastens one’s departure from (or as in Samantha’s case, prevents one from entering) the TARDIS. What seemed to apply in the early years can be applied later in the series, as love interests ultimately resulted in the departures of Jo Grant and Leela in the 1970s. And despite (or because of) possible sexual tension as a result of costuming choices throughout the multiple-companion period of John Nathan-Turner’s producership (which is actually most of the 5th Doctor’s tenure), he held fast to his “no hanky-panky” rule. The revival of Doctor Who changed everything. Not only were Rose’s and Martha’s fancyings of the Doctor made very overt, but the Doctor himself (un)wittingly played along and ultimately broke their hearts during Series 2 and 3. The Doctor’s realization of this led to his taking on Donna as a “mate” during Series 4, but the introduction of Amy in Series 5 seemingly reversed that trend, until “Amy’s Choice” confirmed her love for Rory. 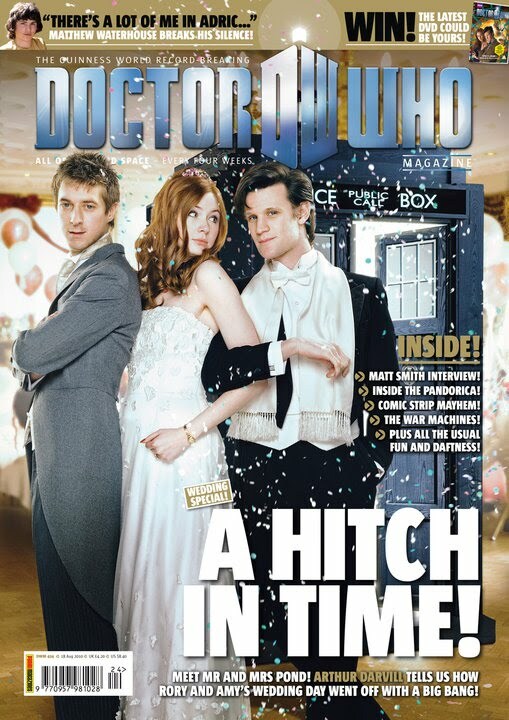 So what adventures will the newlyweds find themselves with the Doctor? It’ll be fun finding out!